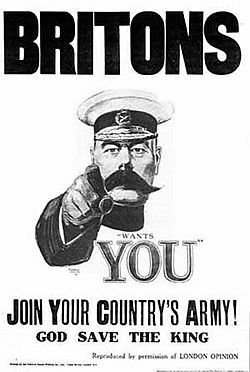 The iconic, much-imitated 1914 Lord Kitchener Wants You poster. Field Marshal Horatio Herbert Kitchener, 1st Earl Kitchener KG, KP, GCB, OM, GCSI, GCMG, GCIE, ADC, PC (24 June 1850 – 4 June 1916) was an Irish born British Field Marshal. Kitchener was Sirdar (British Commander in Chief) of the Egyptian Army. He defeated the Mahdist rebels against Egyptian rule in 1898 and conquered the Sudan for Britain and (nominally) Egypt. He was Chief of Staff during the Boer War of 1899-1902. 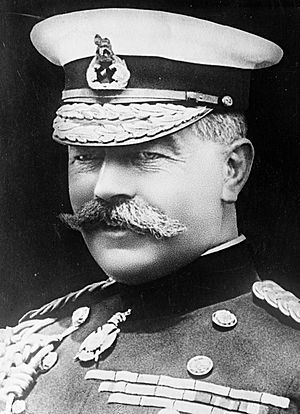 From 1899-1900 he was also Commander-in-Chief of the forces in southern Africa. He was given many orders of chivalry, both British and foreign, including Knight of St. Patrick and Knight of the Garter. At the start of the First World War, the Prime Minister, Asquith, quickly appointed Lord Kitchener Secretary of State for War. A massive recruitment campaign began, featuring his image in a famous advertisement. Kitchener was drowned in 1916 when the HMS Hampshire sunk near the Orkney Islands after hitting a German mine. Herbert Kitchener, 1st Earl Kitchener Facts for Kids. Kiddle Encyclopedia.